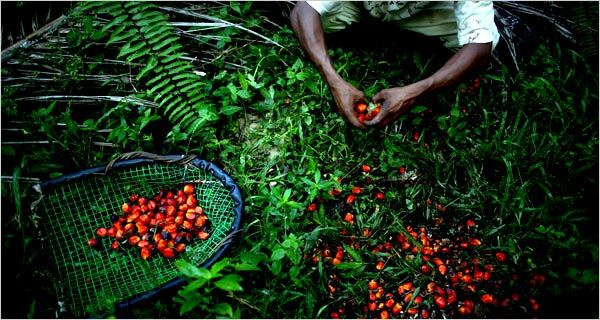 ​Palm oil is an edible vegetable oil high in saturated fats and free of trans fats. The oil palm tree (Elaeis guineensis) is a native to West Africa and was imported into SE Asia in the mid 19th century. Oil palm flourishes in the humid tropics and produces high yield when grown 10 degrees north and south of the equator. Palm fruit develops in dense bunches weighing 10 kilograms (kg) or more and containing more than a thousand individual fruits similar in size to a small plum which tree produces 2 types of oil. Palm oil (PO) is obtained from the flesh of the fruit and Palm Kernel Oil (PKO) is produced by extracting the oil from the internal seed (Kernel). Every oil palm tree requires approximately 3m diameter clear around the base of each tree to allow full growth. Oil palm is highly productive crop which is capable of yielding more oil from less land than any other vegetable oil in existence. One oil palm tree will produce ongoing fruit for up to 30 years deeming the crop as high yielding and sustainable..
Palm Oil is used in around 50% of products consumers purchase and use on a daily basis. Palm Oil and derivatives otherwise known as fractions of the oil are used in the manufacture of prepackaged food, cosmetics, cleaning products, hair care, soaps and personal care items. Palm Wax is used in the manufacture of candles. Palm Oil is also used to manufacture bio fuel and has become what is called the green fuel option for Motor Vehicles, shipping and Aircraft fuel. Palm is also used as feed for livestock named as palm kernel cake (PKC) which is a by-product of palm kernel oil. PKC is considered a medium grade protein feed used to fatten cattle and other livestock. 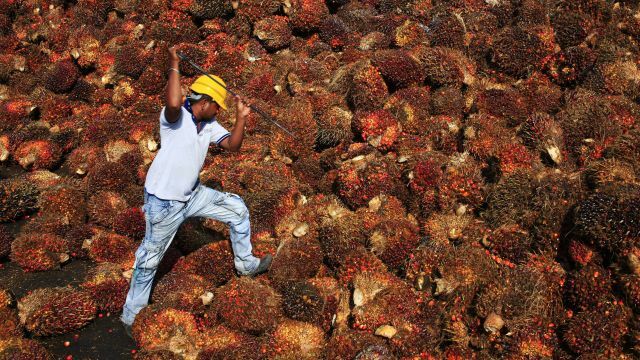 What's wrong with palm oil? The cheapest and fastest way to clear land for plantations is slash and burn. 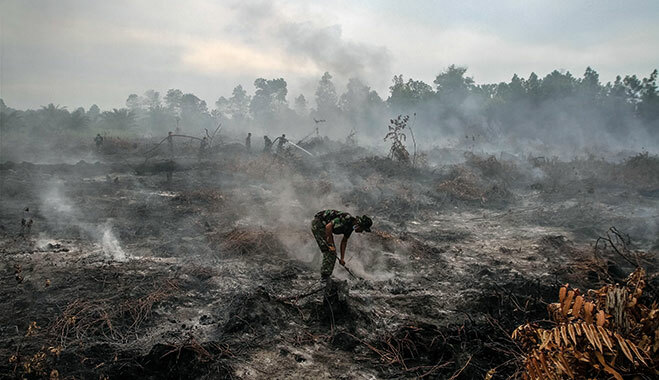 Fires in Indonesia produce some of the world’s worst pollution, sending suffocating smog to cities hundreds of miles away in Malaysia and Singapore. Clearing rainforest to make way for plantations has taken a heavy toll on local communities, destroyed natural habitats for endangered species, and become a critical factor in climate change. Replacing natural forests with palm oil plantations vastly diminishes the ability of vegetation to capture and store carbon dioxide. 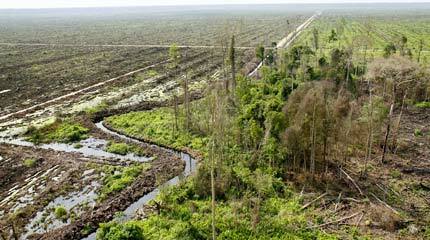 It’s estimated that deforestation contributes up to 20 percent of global warming. Indonesia and Malaysia account for around 87% of global palm oil production and the demand for the cheap oil continues to grow. 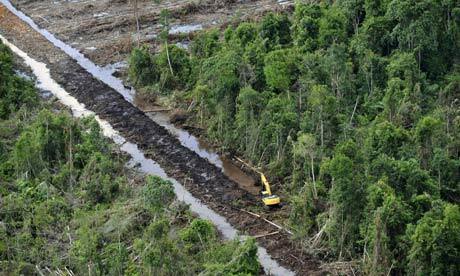 According to WWF (World Wildlife Fund) there are approximately 20 million hectares of abandoned land in Indonesia that could be used for palm oil plantations, however, many palm oil companies are tied in with logging firms. Timber is extremely valuable, therefore clearing virgin forest they get money twice, once for the timber and again for the produce from the oil palm trees. 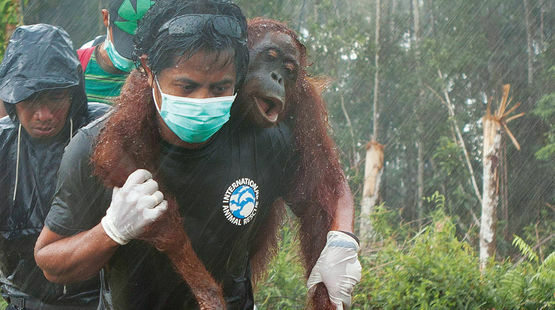 "Orangutans’ poaching is done deliberately as a policy made by palm oil corporations. Therefore they hire local people as pest busters, who serve the corporation with killing any wild animals, including orangutans, which spoil palm oil trees within the plantations. The pest busters will bring up a cut-off hand of an orangutan they have killed and hand it to the corporation as a proof. When they find an adult female orangutan with her baby, they will usually kill the ‘mother‘ and take away the baby for pet or sale". It is estimated that over 50 Orangutan are killed every week due to deforestation. Forest homes are cleared by either heavy machinery or fire. 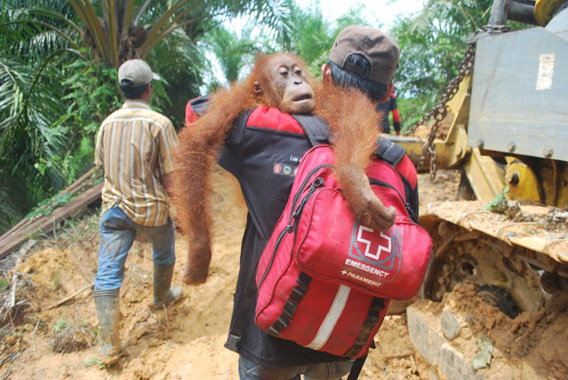 Orangutans are left starved with no food source and often trapped in pockets of isolated areas with no way out and often wander onto plantations searching for food. The orangutan are considered a pest by many of the oil palm companies as they often destroy young palm plants in the hope of finding food.​ They are run over by excavation equipment, doused in petrol and burnt alive, captured, tortured, beaten, shot with air guns or slaughtered. As forest home is destroyed they become vulnerable to poachers. Infant orangutans have monetary value and are often kept as pets or illegally smuggled, the only way a mother will let go of her infant is if she has been killed. Elephants are often killed by poisoning. Due to habitat loss and lack of food, elephants wander onto plantations and into villages and destroy crops. Human, elephant conflict is becoming more common as habitat is cleared for oil palm. Plantations and local villages often poison the elephants and snare traps are also set in the forests near the areas they are encroaching. Tusks of the elephants are often removed to give the impression to authorities that the deaths were due to ivory trade rather than land encroachement. Tiger and Rhino numbers are so low due to habitat loss and poaching that their extinction is rapidly nearing and we cannot let this happen. This chart will show you where pressure needs to be applied. The food industry is responsible for 72% world wide usage of palm oil. Palm derived ingredients used in personal care and cleaning products are responsible for 18% of world wide usage. 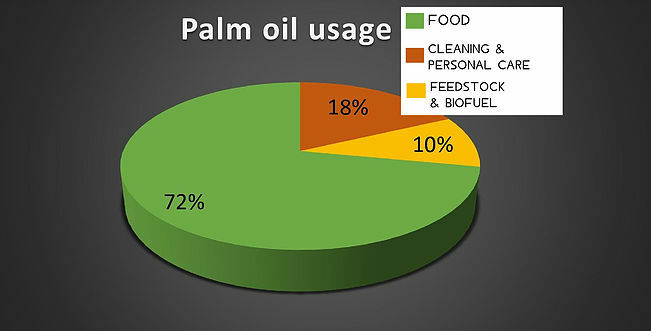 ​Biofuel and feedstock is responsible for 10% of world wide palm oil usage. Why do brands use palm oil in their products? Palm oil is also a very bland cooking oil so it does not affect the taste of products. Palm oil also increases shelf life of pre- packaged food and finally, palm oil has a very high smoke point so it is perfect for rapid frying products such as 2 min noodles etc. 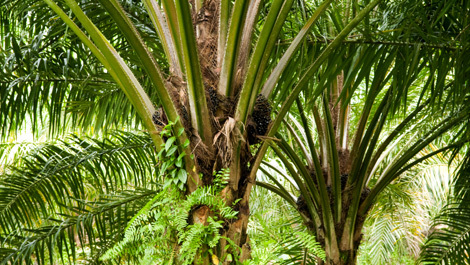 Personal care and cleaning products use palm oil for different reasons. Palm oil is extremely versatile and is used to manufacture many ingredients due to its high fatty acid content which is required to manufacture emulsifiers and surfactants. 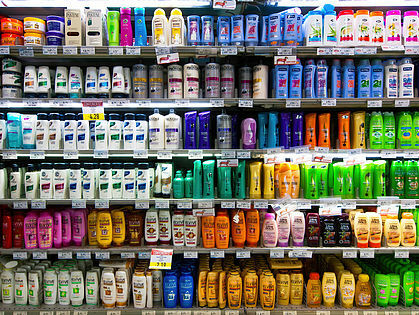 ​How many supermarket brands use palm oil in shampoo & conditioner? Truth is, every single brand of shampoo and conditioner sold in supermarkets DO USE PALM OIL however the palm content is hidden under various names. So as a consumer be aware that just because you may see one brand clearly label palm oil as an ingredient it does not mean that all others on the shelf either side are palm oil free. There are over 200 names for palm oil derived ingredients. We have found that brands that clearly label palm oil on the packaging of these types of products are sourcing ethically. What was used before palm oil? Petrochemicals and animal fats were used, so replacing these options with palm oil was the most ethical choice at the time. Palm oil has a long carbon chain of fatty acids which makes it easy to manufacture derivatives for personal care and cleaning products. 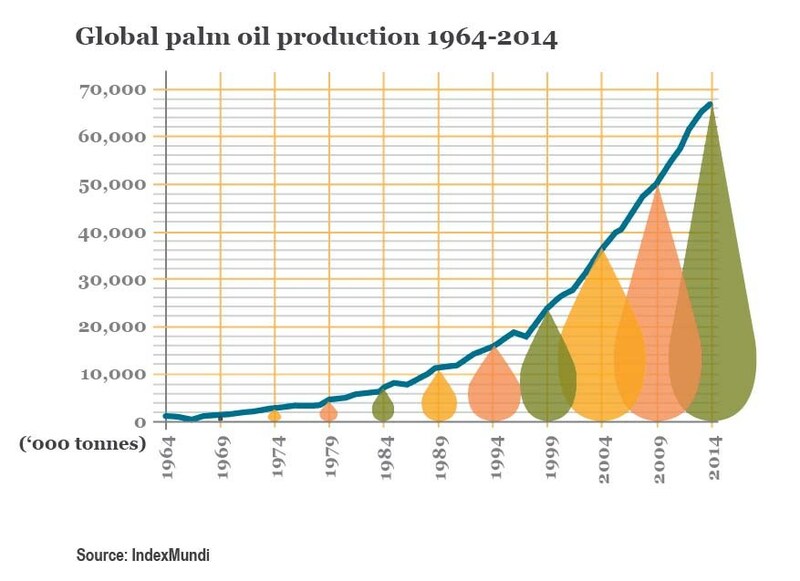 Palm oil production still on the rise. Image: Union Of Concerned Scientists.